﻿ The Nature Villas & Resort, Da Nang | FROM $32 - SAVE ON AGODA! "The place was beautiful - great room and staff very helpful..."
Have a question for The Nature Villas & Resort? 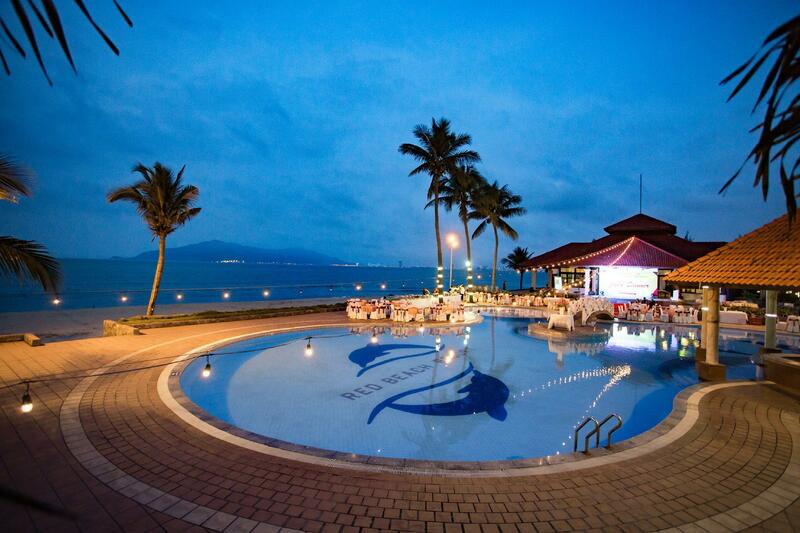 Well-placed in the beaches, restaurants, sightseeing area of Da Nang city, The Nature Villas & Resort provides a most conducive spot for you to take a break from your busy days. The hotel is not too far from the city center: just 10 km away, and it normally takes about 10 minutes to reach the airport. A well-kempt environment and its proximity to Xuan Thieu Beach, Nam O Beach, Hoa Khan Market give to this hotel a special charm. At The Nature Villas & Resort, the excellent service and superior facilities make for an unforgettable stay. While lodging at this wonderful property, guests can enjoy 24-hour room service, free Wi-Fi in all rooms, 24-hour front desk, luggage storage, Wi-Fi in public areas. 48 rooms spread over 2 floors provide a warm and pleasant home away from home. Modern comforts such as television LCD/plasma screen, internet access – wireless, internet access – wireless (complimentary), non smoking rooms, air conditioning can be found in selected rooms. The hotel offers many unique recreational opportunities such as hot tub, private beach, sauna, outdoor pool, spa. Enjoy unparalleled services and a truly prestigious address at the The Nature Villas & Resort. The property provides daily shuttle service to downtown areas. Kindly contact the property for more details. The property provides shuttle service to watch the fire-breathing dragon at the Dragon Bridge every Saturday and Sunday evening. Kindly contact the property for more details. Rooms are very far from hotel breakfast restaurant, every time need car to go for hotel breakfast or go back to room, there is strict regulation that no visitor after 9pm, may not be convenient for celebration occasions. I stayed here before. Back after several years, a little bit old but still okay. Spacious room, relatively clean. Pros: Beautiful grounds and view from some rooms. Helpful friendly staff. Cons: Swimming pool across and next to busy road. Dirty beach. Restaurant unhygienic with untrained staff. Flies on cut fruit and salads. Limited breakfast only for Asian palette. Other facilities and restaurants a long taxi ride away. No fault of the staff but owners need to rethink about the comfort of travelers. the place was beautiful - great room and staff very helpful . Was not so happy with the breakfast buffet or the distance away from town but good value. I wanted to have a weekend where I would get away from everything, and from this perspective it was great. However, it is quite a distance out of the city, which means you need to take an (expensive) taxi ride if you want to have dinner elsewhere. I ate my meals at the hotel, and enjoyed all of it. The only negative I can point out is that the wifi signal was very weak in my hotel room, and being an open system, I did not feel comfortable using it for some things I needed to do (e.g. transfer money). Other than that I had a great stay. Very nice place to stay although we arrived just after the typhoon hit, so the pools were not filled at the time. If they were filled and weather was sunny, it would have been a perfect stay. It is not far from the city. Food is decent for breakfast. We were rather impressed with the rooms and especially the bathrooms which were really clean and huge considering this isn't a luxury beach resort. The rooms were comfortable, room service was quick and good. Our rooms had patios that overlook the garden which was a nice bonus. There was a lot of greenery. The staff were friendly and helpful enough, however they still tried to hard sell transport service which I had found out after my stay to be slightly more expensive than a metered taxi. The location is rather far out, it takes a while to take a taxi to the city center where most of the good food is. The beach wasn't exactly the best for sunbathing or swimming, either. Good for a relaxing holiday away from the hustle and bustle of city life. We stayed only one night, as there was no internet access from the room, which is a must for us. The room was a bit small with the extra bed, and as we arrived late (after 9PM) we also discovered room service 9PM, and no restaurant in the area. Apart from that, the hotel is quiet, the garden is beautiful, and the restaurant on the beach good. Staff and relaxed open beach feel. I enjoyed staying at this resort because it was out of town, very quiet and relaxed. The pool was very clean and the food and food service was great. Only drawback was you had to cross the road to reach breakfast, pool and beach, but the road was not that busy. Nice view with swimming pool and some step to the beach. I had a nice trip with 2 days relax. I liked resort ,it location near the beach just some step. Nice swimming pool and room very romantic to see a lake and garden. My family felt relax. Good,nice view, room is clean but mosquitoes,the breakfast buffet was fantastic. the weather wasnt great when we visited, but the pool definitely looked inviting. Not very good location, but near to sea, staff are friendly. Massage is worst ever. Will not stay next time.